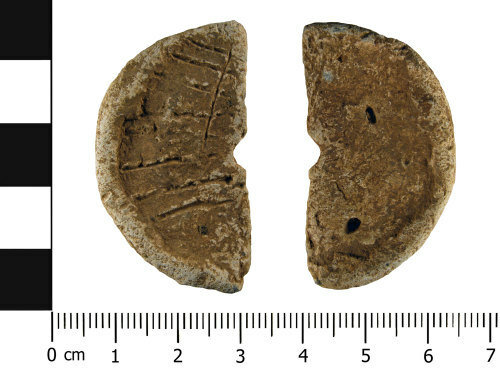 A lead alloy weight or possible spindle whorl of Roman to Post Medieval date (AD1 - 1650). In plan the object is semi-circular. The object has a central semi-circular perforation which measures 4.10mm in width. It is possible the object was once circular and only half of the object is now remaining. The upper surface is decorated with a series of linear incisions. The reverse surface of the object is un-decorated. The object has a cream coloured patina across all surfaces. Spindle whorls and weights have been used for a long period of time and are therefore very difficult to date precisely without other evidence (such as pottery). Weights with a similar diameter and perforation have been classified as flat weights for bullion (Biggs and Withers 2000: 23-26). The object measures 44.12mm in diameter, is 7.7mm thick and weighs 37.5 grams. Biggs, N and Withers, P. 2000. Lead Weights: The David Rogers Collection. Llanfyllin, Powys: English Weights Series - 6.